Whiplash - the resulting instability of the spine and soft tissues can result in headaches, dizziness, blurred vision, pain in the shoulder, arms and hands, reduced ability to turn and bend, and even low back problems. As the body attempts to adapt, symptoms may not appear for weeks or even months later. Bailey Chiropractic Centre of High Point, NC can help with whiplash injuries you may suffer from auto or othe accidents. Bailey Chiropractic Centre serves local NC residents of High Point, Greensboro, Jamestown, Deep River and surrounding areas of North Carolina. Bailey Chiropractic Centre of High Point, North Carolina's approach to whiplash injuries is to use specific chiropractic adjustments to help return spinal function. After a thorough case history and examination, Dr. Bailey will recommend a series of chiropractic visits to help restore proper motion and position of spinal bones. If caught early enough, inflammation can be reduced and scar tissue can often be minimized. Occupants can suffer more than the car during an auto accident. 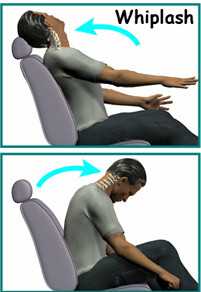 Even though the car may have received little damage, occupants can suffer serious spinal injury. Consult Baley Chiropractic Centre of High Point, NC before enduring constant headaches, depending upon addictive pain medication, or submitting to surgery! If you are suffering from whiplash pain, contact us today. Our chiropractic services can help.